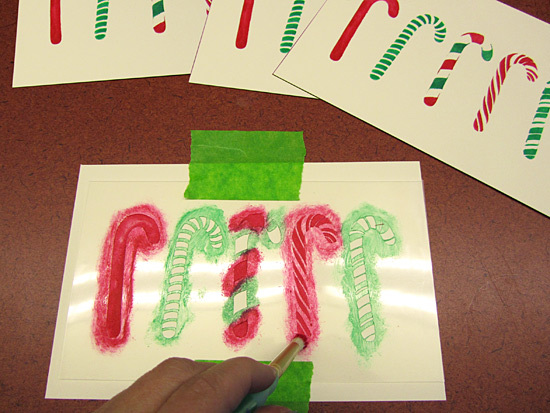 Home Holiday decor ideas Holiday Card Making with Stencils! 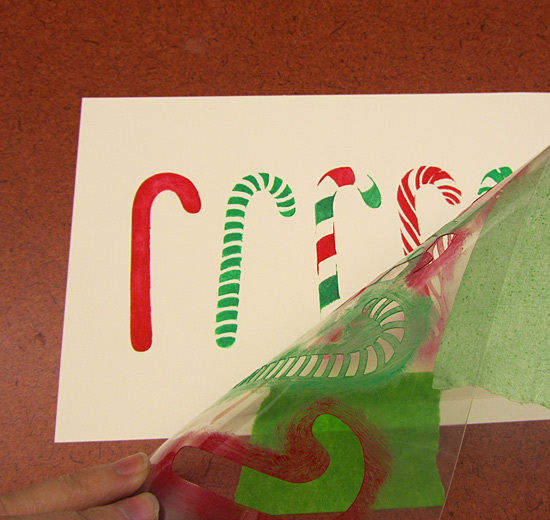 Making cards with stencils is pure fun! 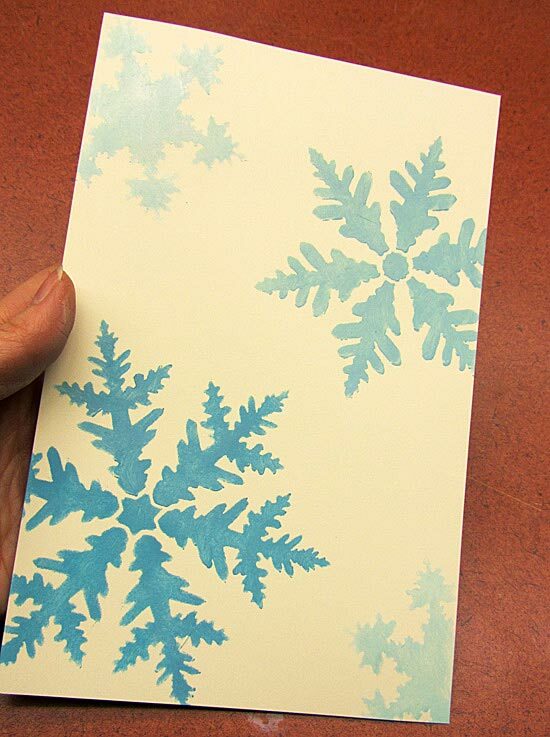 Nothing beats a hand-stenciled card when it comes to adding a “personal touch” to you gift. So how do we do it? Easy! And fast. 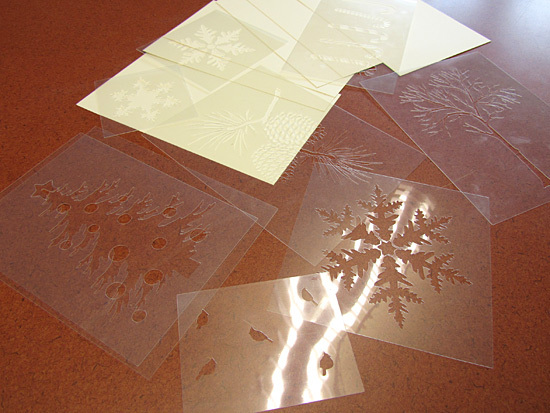 We have 6 lovely card stencil designs to choose from. Each design will fit a 5.5″x8″ card, or larger. 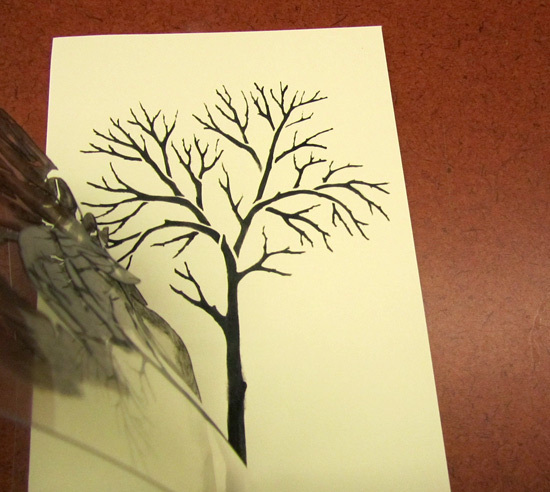 I just cut my cards out of a large sheet of sturdy card stock paper. 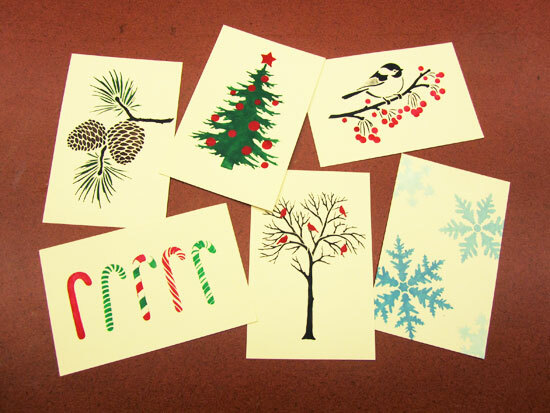 Here are our blank cards and stencils! 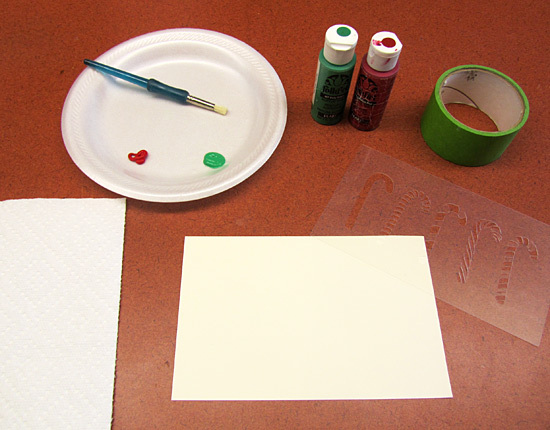 And here’s what you need to do this: a blank card, a stencil, a stencil brush, some acrylics, a styrofoam plate, low tack tape and a piece of a paper towel. 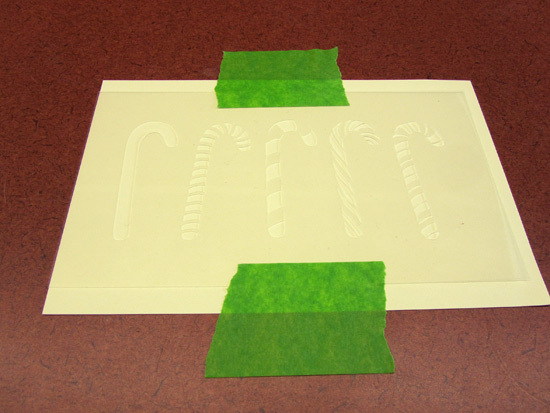 We’ll start with securing our Candy Cane Stencil over the card with 2 pieces of LOW tack tape. Make sure to use low tack tape so it doesn’t damage your card! Regular blue tape can be made “low tack” but taping it few times to a wall and removing it, this will reduce the tack. 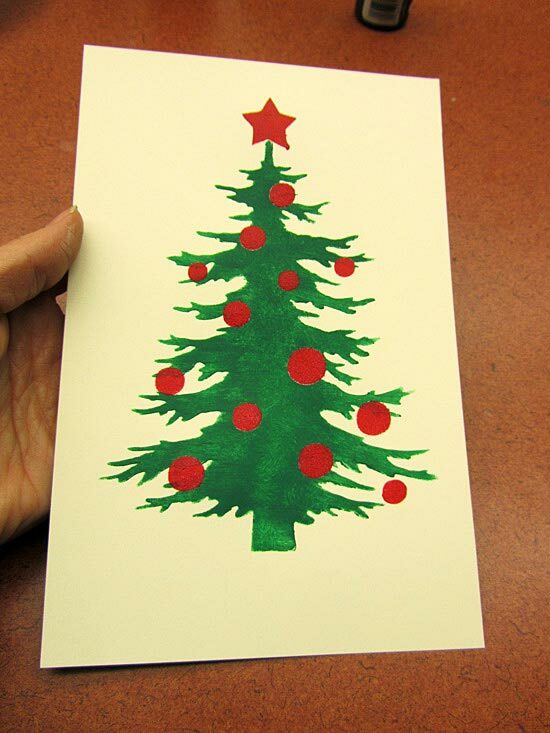 Make sure the card is secured or it will move around during stenciling. 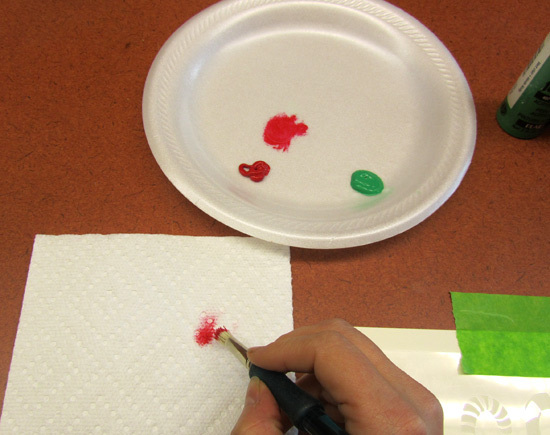 Very important to offload some paint onto the paper towel. Less paint is better, trust me. 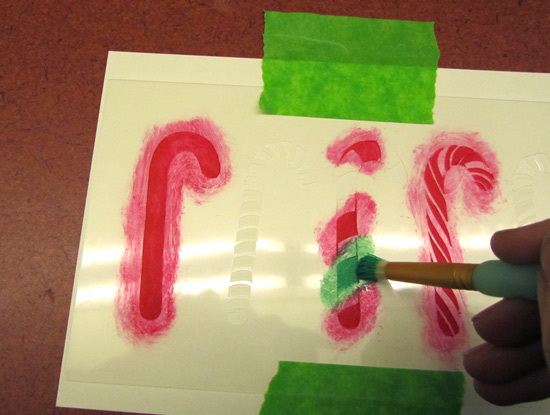 Start stenciling by dabbing and swirling paint over your stencil. Finish all the parts of the design that you want to be red. 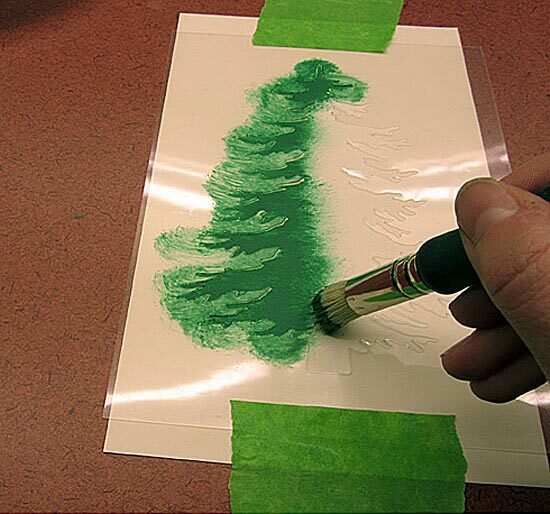 And now take a second brush (or wipe the first one really really nice) and stencil the green parts! Use dabbing up and down motion, or gentle sweeping-swirling motion. The best part is to remove the stencil! 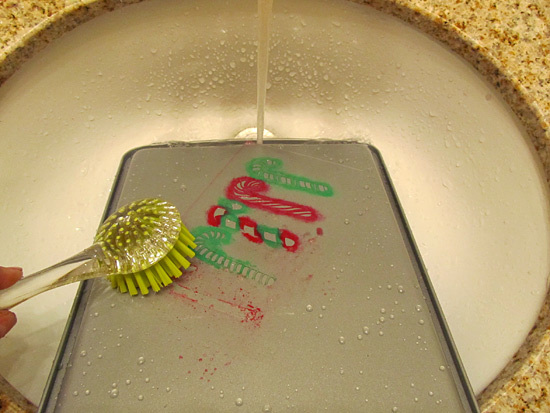 Now let’s do this again, and again, and again… Don’t clean the stencil in between, no need. We’ll clean it all in the end. 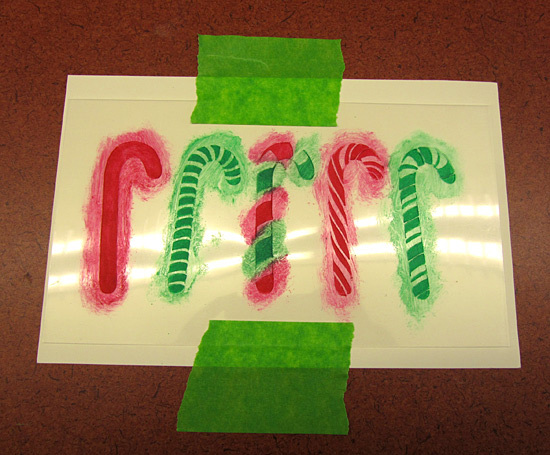 Now that we have enough Candy Canes, let’s try a different stencil design! Cute Little Birdie. I love birdies. 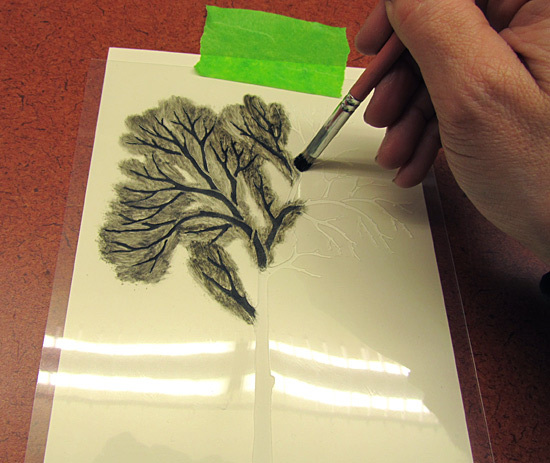 And now let’s try a simple 2 overlay stencil. It’s simple, and just as fun! 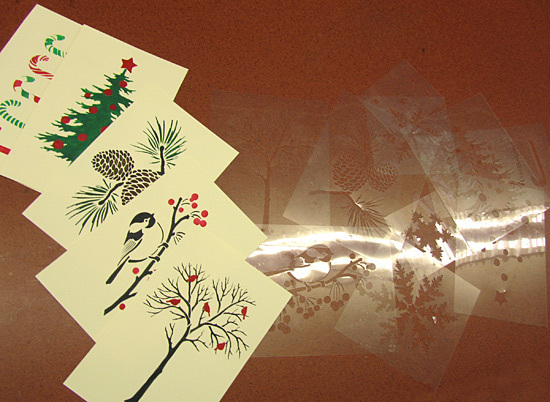 We’ll stencil our Winter Cardinals. 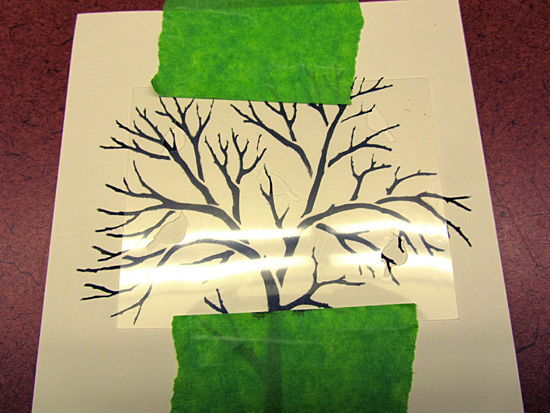 Start with the first layer, in this case, a tree. 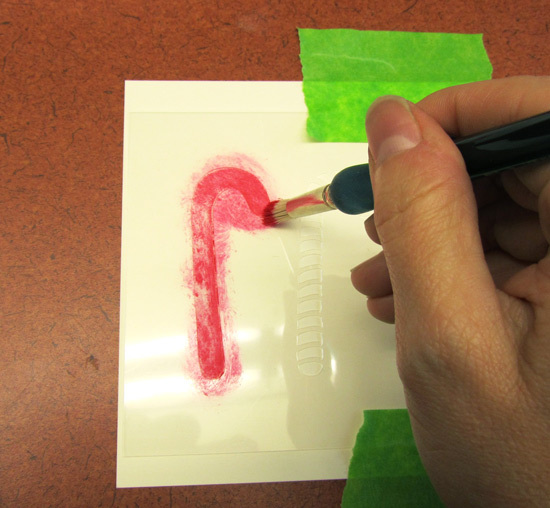 Place the second stencil overlay over the finished first print… Make sure it’s is dry, but usually paint dries almost instantly on paper. 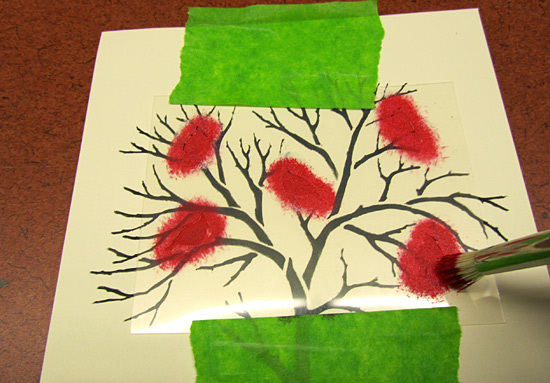 Second stencil layer: cute red cardinals! 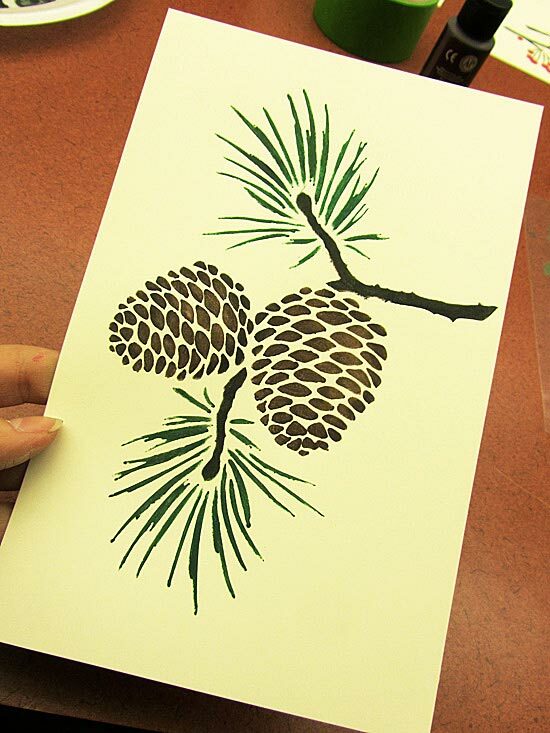 I place the second stencil by eye, a little bit off here and there wouldn’t matter for this design. 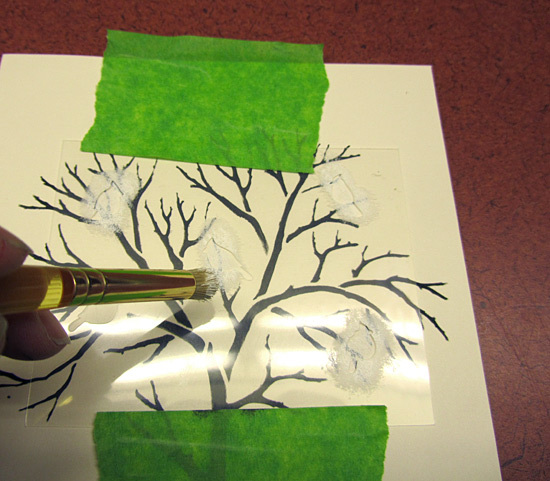 And now here’s a little stenciling trick for ya! Our Cardinals should be red, right? The thing is that most red paint doesn’t cover very well. I don’t know why, it just doesn’t! 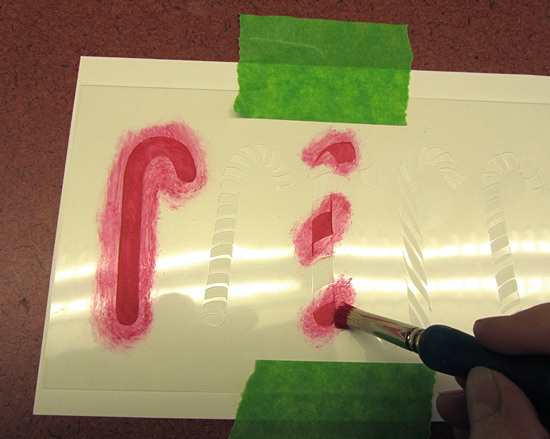 Latex, acrylics – it always ends up being somewhat translucent (see-through). And since we don’t want these black branches showing through our cute red birdies, we’re going to white these braches out. Very nice trick for stenciling any light elements over dark background, if you want these elements to pop. 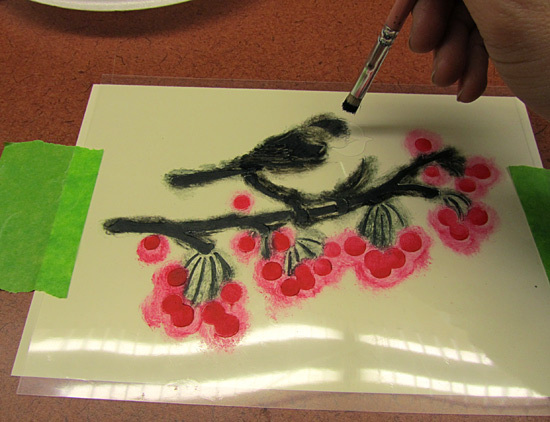 So, we take a little bit of white (or off-white) acrylics and lightly stencil the birds. This knocks the black branches way down. 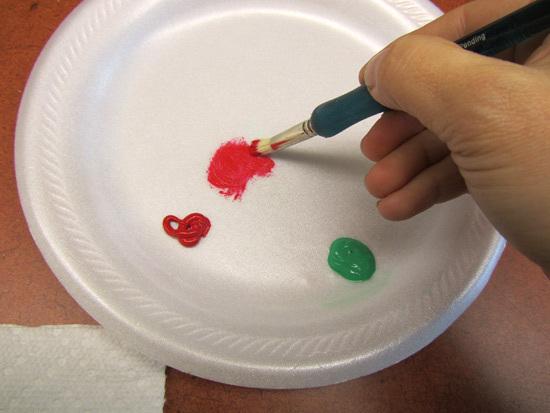 Make sure the white paint is dry before continuing, give it just a minute. Otherwise you’ll get pink cardinals! 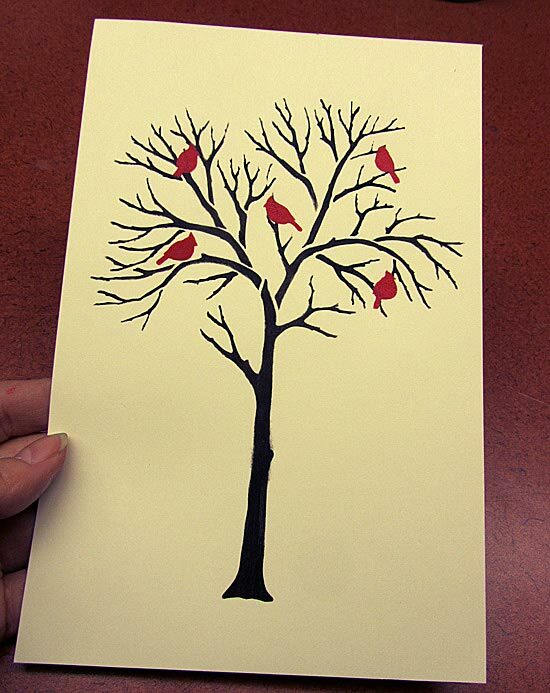 OK, now we can stencil the birds in red. I would even do 2 coats, to make sure they are totally, completely covered in red. 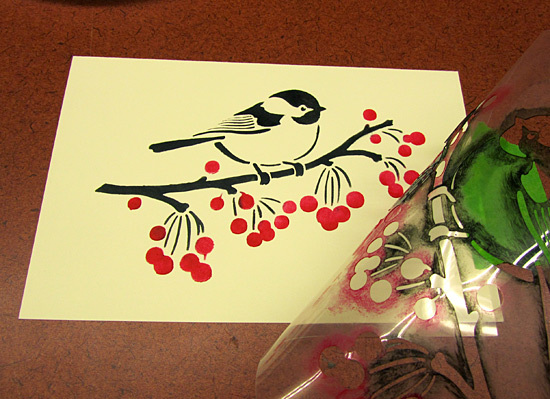 And here’s our Winter Cardinals stenciled card! Pretty! 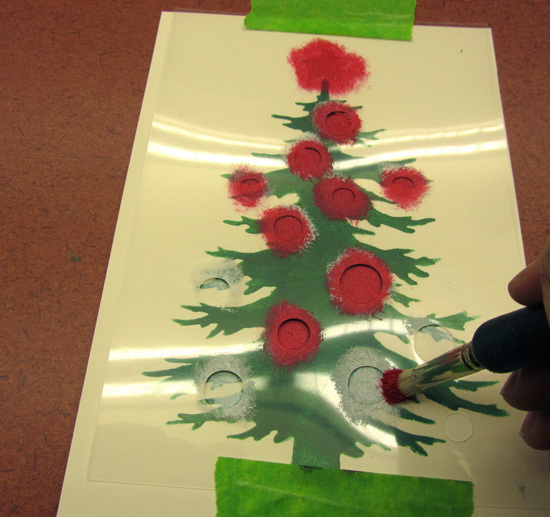 Now we can stencil our bright red ornaments. Look how nice this one turned out! 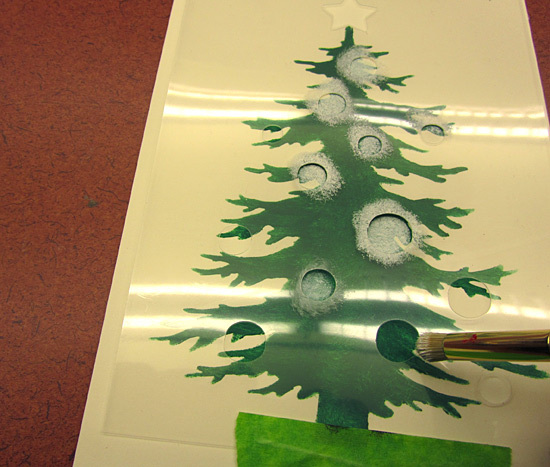 And now we can clean all the stencils and put them away till next Holiday season! 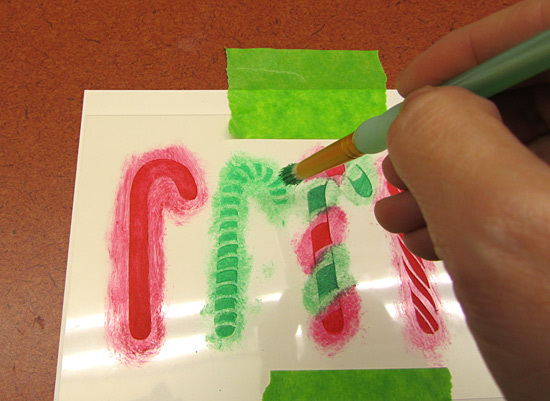 The clean up is super easy, just place the stencils on the flat surface (a.k.a. baking tray) and scrub with a somewhat stiff brush. 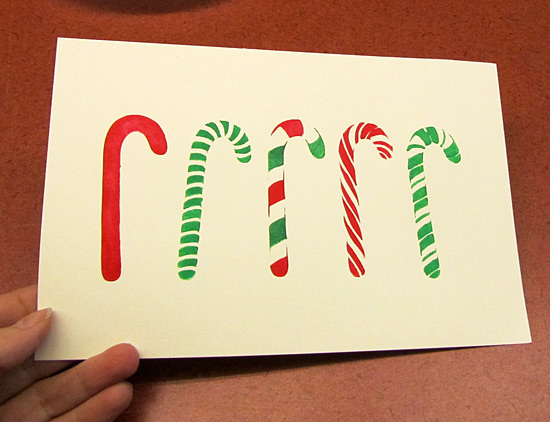 Happy Holidays and Happy Card stenciling !